What happens when persons protesting against the ‘missing’ are confronted by persons protesting against those missing because of the ‘missing’? What happens when the persons protesting against the ‘missing’ number just 20 in addition to members of the ruling Northern Provincial political party led by Ananthi Sasitharan are confronted by over 300 persons holding pictures of their missing children demanding what Ananthi’s ‘missing’ person did to their children? Not a very pretty sight. The outcome of course was a first case scenario of Ananthi, the TNA brigade and their handful of protestors fleeing for their dear life. It was also a case of TNA having to seek protection from the law enforcements the TNA is demanding out of the North. That was what happened on 5th June 2014 outside the Divisional Secretariat Office while at the Mullaitivu courts the case filed by Ananthi Sasitharan on behalf of her ‘missing’ husband –Elilan the infamous LTTE leader was taken up. The outcome certainly providesinspiration to the rest of the Tamils who had been victims of the LTTE for 3 decades and sends a clear signal that the tables have turned and the hunters are now getting hounded -Finally. Anandi Sasidaran’s case filed on behalf of her ‘missing’ husband was taken up at the Mullaitivu courts on 5th June 2014. Anandi Sasidaran has conveniently forgotten that her ‘missing’ husband was responsible for forcibly taking away scores of children and men during the last stages of the war. The UNHRC forgot this fact too when she was given airtime of NGOs representing causes of other countries to bemoan about a ‘missing’ LTTE terrorist leader. The Geneva gathering while holding buckets for Ananthi’s tears did not stop to wonder how ‘innocent’ Elilan, Ananthi Sasitharan’s ‘missing’ husband actually was. The 300 protestors on 5th June 2014 showed exactly what ‘missing’ Elilan had been upto. 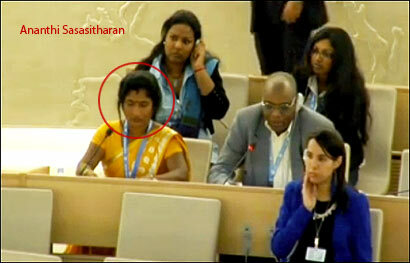 UNHRC must stop and wonder whether they should moan the LTTE leader or the hundreds of missing children and men whose fate are unknown and wonder why the hub of human rights chose not to ask the question from the spouse herself as she sat before the Geneva gathering shedding crocodile tears. On 5th June 2014, TNA politicians Suresh Premachandran, Sivajilingam, Selvarasa Gajendran, Gajendran Ponnambalam, Thurairasa Ravikaran, Antoni Gajendran made a choice. They chose to support Ananthi Sasitharan and the case filed by her on behalf of her ‘missing’ husband. The choice of the TNA politicians was to side with an LTTE leader. Suresh P’s placard says he’s lost his patience searching for Elilan – the Tiger leader! Ananthi S’s placard is calling for Angel of Justice to intervene – lucky for her the Angel has and Justice took the side of the REAL VICTIMS, the parents from whom Ananthi’s husband, Elilan and Suresh Premachandran’s friend forcibly took children to turn into cadres. By the way, we did say that Ananthi support team had 20 or so protesters… it looks like the numbers may be less! Suresh Premachandran and Co did not think twice about or wonder whether it was right for them to support an LTTE leader now supposedly ‘missing’. Suresh Premachandran and Co did not for a second wonder whether it was fair on the scores of Tamils from whom the LTTE plucked children and men and turned into cadres. Suresh Premachandran now seeking advice from Tamils and Diaspora Tamils may like to answer this question. Let’s not forget that LTTE’s cadres were mostly made up of KIDNAPPED Tamils who had been BRAINWASHED into taking part in LTTE terror. The significance of this event of protestors coming out in their numbers must be making the TNA sweat. Their thus far comfort zone is now being challenged-for the first time and in the open. It must be sending shockwaves among the TNA leadership while LTTE Diaspora must be wondering how to counter the new menace. What is assured is that if the trend continues no amount of foreign support or Indian support can change the behavior of Tamils deciding to question the TNA who was intricately linked to the LTTE. It is a good time for the Tamil victims of LTTE to start demanding from the TNA-LTTE fronts and LTTE supporters to return at least some of the amounts the LTTE had been coercing from them especially from those living abroad on the threat of killing their families back homw. The Human Rights Watch has also compiled a report titled “Trapped and Mistreated LTTE Abuses against Civilians in the Vanni” and gives a good background of exactly how LTTE treated Tamils and is a good time for those supporting the TNA to also wonder exactly with whom they have placed their bets! The clout that the TNA and LTTE had pre-May 2009 does not need to be elaborated. The story is now being re-written and the tables are now being turned. 2. Those Tamils who refused to support / refused to make contributions – how many belonged to this number is a question yet to be answered. Let’s talk numbers – how many Tamils support TNA-LTTE-LTTE fronts and how many Tamils don’t support them? – Ask the pundits and experts and insist that they reveal the numbers because we can’t get anywhere without knowing the numbers we are dealing with/against. The importance of knowing who actually supported or supports the LTTE still will provide the numbers to who are supporting the TNA and the LTTE fronts – whether they are living in Sri Lanka or overseas. Against this we need to know how many actually are against LTTE – TNA and the LTTE fronts operating from abroad. We need to identify the nexus that keeps Tamils bound into an insular framework and denies them any opportunity towards reconciliation efforts. The nations preaching on national reconciliation needs to wake up to these ground realities and must be told to get rid of the nexus if they truly want national reconciliation to take place in Sri Lanka. Simply preaching about national reconciliation, drafting resolutions against Sri Lanka while supporting the TNA-LTTE fronts and LTTE supporting Tamils to prevail is not going to get anybody anywhere. The marked difference in handwritten placards as against the printed placards used by TNA shows the spontaneity behind this protest as against the professionally organized events of TNA. It also provides a very clear picture to all those attempting to showcase a very distorted version of affairs in the North of Sri Lanka largely helped by foreign envoys attempting to canvass as common candidate of late flouting diplomatic decency and protocols! The incident that took place in Mullaitivu did have foreign presence in the form of mainstream media. Nonetheless, the bias of their coverage can be seen by how they have covered the event – as was expected they did not take the side of the real victims, the parents in search of their missing children, but the TNA and their 20 or so supporters. Angel of Justice, it is time that the world knew who the real crooks are. Thnaks Shenali Waduge, it is time for TAMILS living in the NORTH to question the present leeaders of TNA, past LTTE & present supporters, WHY did the LTTE /TNA supported KIDNAPPING young childdren from Tamil families. NOW rhey could ask why the so called TNA members STILL support LTTE ideology & harm poor Tamils who live in North & East of Sri lanka. In a related matter, Shenali SOMEONE has BLOCKED my reading LANKAWEB newspaper. May be they are so worried that TRUTH will come out about LTTE atrocities through contributors to LANKAWEB. It is a very OPEN FORUM where people of all STRIPES express their views. SOMEHOW Tamils & LTTE supporters cannot bare the ONSLAUGHT day in day out, by writers to Lankaweb dish out. We have not even started our CRITICIM of LTTE / TNA & their supporters yet. There are more people joining in CONDEMING LIES, half truths, put out by Tamils & their supporters.